Jason Linn is a senior majoring in both music and polymer engineering. He currently studies trombone under the sage tutelage of Paul Ferguson. Jason began studying the violin in kindergarten but never made it past the first half of the first Suzuki method book. He then studied the piano for several years before finally discovering the trombone in fourth grade. Before coming to Case, Jason performed with numerous school ensembles, the Greater Twin Cities Youth Symphonies, and the Minnesota Music Educator Association’s All-State Orchestra. On campus, he is involved in polymer physics research in the Macromolecular Science and Engineering department and is a member of Tau Beta Pi, the Honors Engineering Society. 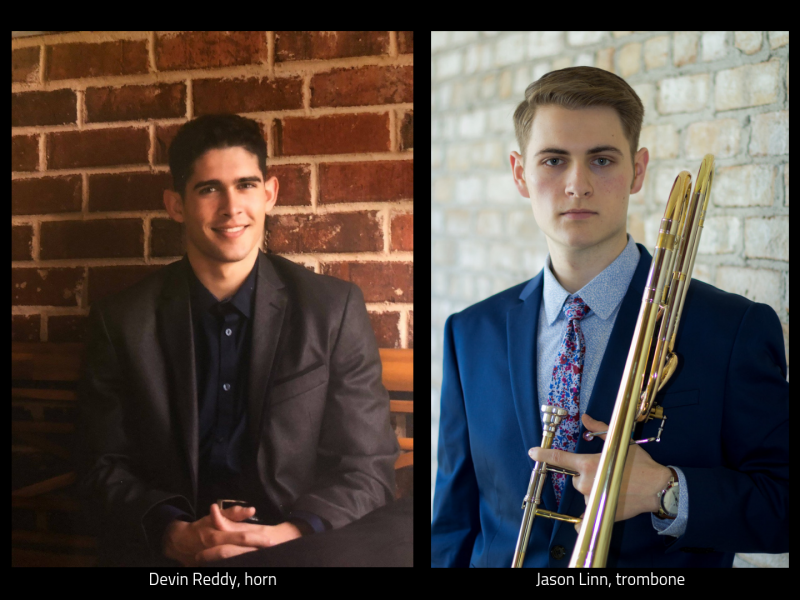 Jason was selected as a winner of Case’s Concerto Competition in 2017 and performed Gordon Jacob’s Concerto for Trombone and Orchestra with the CWRU Symphonic Winds this past February. He performs regularly in a variety of ensembles on campus. Jason is currently applying to graduate programs, planning to pursue a PhD in materials science. Devin Reddy is in his 4th year at CWRU, earning his Bachelor’s of Arts in Biochemistry and Music. Prior to that, he graduated from Allen High School, with honors, in his hometown of Allen, Texas. Devin studies Horn with Meghan Guegold through the Cleveland Institute of Music-CWRU Joint Music program and previously studied with Chris Dulin back in Texas. Winning several awards for his playing, Devin won Second Prize in the New Albany Symphony Orchestra Concerto Competition, won the CWRU Concerto Competition, and co-won the Ronis Memorial Recital Prize. He has also attended the Rafael Mendez Brass Institute, Pacific Region International Summer Music Academy in Canada, and Trentino Music Festival in Italy. Devin has served as Principal Horn of Case/University Circle Symphony Orchestra and CWRU Bands and is a member of Case Chamber Music and the CWRU Horn Ensemble. When not busy with academics, playing Horn, or in the laboratory, Devin enjoys going to the gym, spending time with friends and family, or playing with his dog. Leonard Ronis established the Joan Terr Ronis Recital Prize in 1996 as a memorial to his wife, the well-known Cleveland piano soloist, chamber music artist and teacher. The prize and recital are presented after a competition held each spring among undergraduate music students attending Case Western Reserve University. Mr. Ronis, a lifelong supporter of CWRU and the arts, was nationally known for his role in public transit. With Mr. Ronis’ passing on July 4, 2012, the family requested that the prize be renamed the Leonard and Joan Terr Ronis Memorial Recital Prize. Reception to immediately follow.